1/8” U-channel can be cut with a sharp pair of diagonal pliers by nipping through the top and bottom and then folding. All sizes of box channels are best cut with a saw, either a hacksaw (choose a blade with at least 36 teeth per inch), a razor saw of the kind used by model makers (Xacto is a widely available brand) or a small power saw specifically designed for metal came channels. NEVER use a standard woodworking chop saw! 1/8” U-channel may be used to protect the edges of a small panel, lamp or box, and it is sometimes used to provide a track into which a photo or a cardboard easel-back can be inserted. Box channels are generally used to add strength or a finished appearance to stained glass panels. Making a gauge card: When drawing a panel on which box channel will be used, it is useful to make a gauge card, a piece of light cardboard or heavy paper on which you have drawn three tick marks for the inner or daylight line (DD or Daylight Dimension), the OM (Outside Metal dimension), and the glass cutting line. One gauge card should be made for each size of box channel, labeled and hung on a wall for easy quick use. Using a gauge card: When drawing a rectangular panel which must have a specific OM (outside metal dimension), start by drawing the rectangle for that dimension as a solid pencil line, then mark each of the four corners both up-down and left-right using the gauge card to make tick marks for the DD (inner daylight line) which should be penciled in lightly, as a dotted line, and the glass cutting line, which should be drawn solidly. Work on the edge of your bench, and put a nail or a wood block behind the zinc to act as a stop to hold the work against the saw thrust. 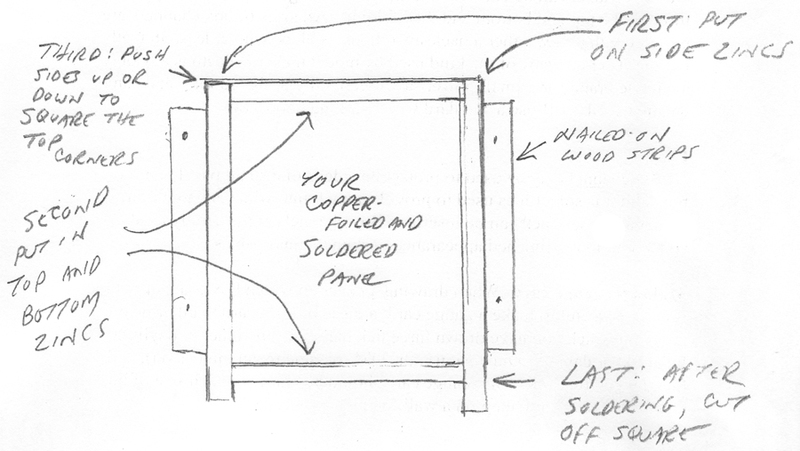 The “Goal-Post Method” for framing a copper-foiled panel: See the drawing below. This works Well and it’s fast because it avoids making angled cuts. First cut the side pieces of zinc, make them a bit longer than actually needed. Put them on the panel (you can use masking tape if you need to) and hold them in place with two wooden strips lightly tack-nailed to the bench. Second, cut the top and bottom pieces to fit tightly between the sides. Push the sides down to get an exact square corner at the top. Solder all four corners. Finally, cut the extra bit oft-the sides at the bottom.